We’re living in a world where the multiplayer games are lacking invention and instead developers continue to opt for battle royale modes. Everyone is trying it and it’s already getting tiresome. 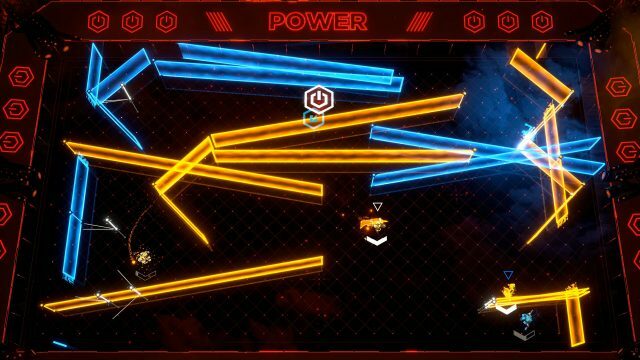 When a game releases that offers something a little different it’s always a pleasure to get stuck in and Laser League is one such game from developer roll7 of OlliOlli fame. 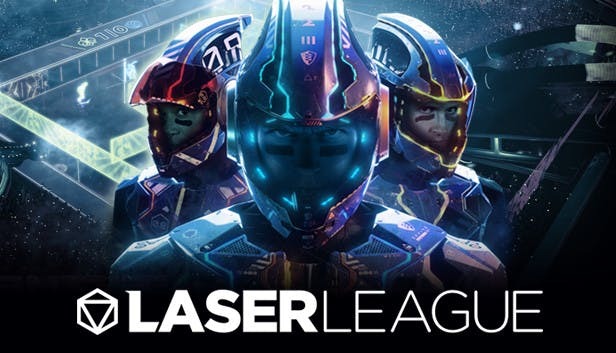 Laser League sets itself up as a futuristic competitive sport where players pick a class, enter an arena and manipulate laser walls to take down an enemy team. 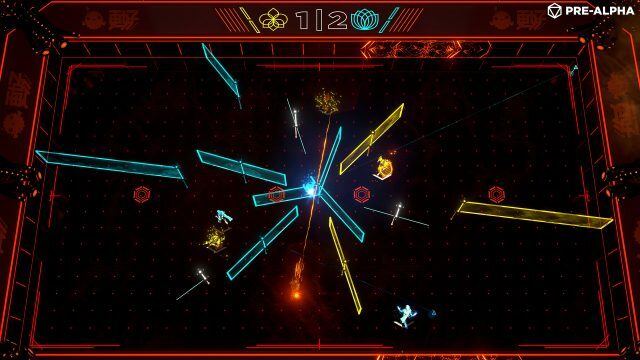 Playing from a top-down perspective, players enter a variety of futuristic arenas in which nodes spawn throughout a match and these need to be tapped by players in order to control them. When captured, these nodes emit a laser beam which changes to their team’s colour making that laser wall hostile to the enemy team. If a player from the opposing team touches the laser beam they are taken out. It’s a simple premise but the game is far from simple. The great thing about Laser League is it’s simple to understand but like all good games is hard to master because of the strategies and tricks that can be employed. The game comes with a pretty solid tutorial which takes you through the basics, but I managed to figure it out in some test matches without using the tutorial which was an encouraging sign. You can play against the AI which is thankfully challenging, so if you can’t play online don’t dismiss Laser League. Matches are currently set at 2v2 or 3v3 but no doubt we’ll see other combinations appear in the future. The game gets interesting when you begin to mess around with the classes. There are six in total. Smash which can knock enemy players back, Thief which can steal nodes, Shock which stuns players for a time, Ghost can become invulnerable, Snipe can teleport across a laid down marker trail, and finally the lethal Blade which can slash an opponent to bits. Like all good multiplayer games, figuring out a good combination to make a solid team and working out which classes can counter each other adds another layer to the frantic gameplay. It takes some practice mastering the classes but there should be at least one that will suit your play style. 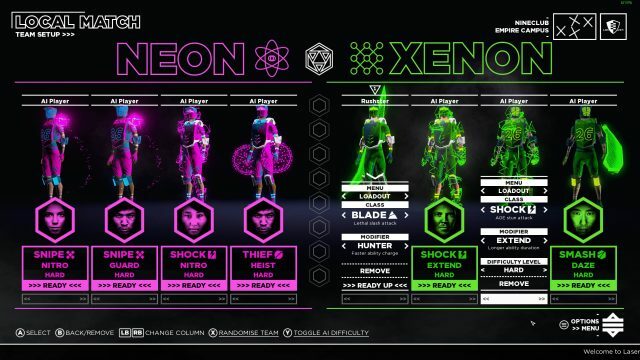 Each of the classes can only use their special ability when it’s been charged up indicated by a charging chevron under each player. Everyone can see when an ability can be activated which allows you to see if it would be a good time to attack or evade. For example, if you’re playing Shock to stun players, use it when a Blade character is nearby. Stun the player and then let the Blade come in and take him out. On top of these classes, modifiers can also be equipped which change how an ability functions. For example, there are modifiers that can stun for longer periods, reduce cooldown and more. Again, depending on how you want to play a class will determine which modifiers to use. The controls are so simple, you only have movement and one button to press to activate the ability. It’s best played with a controller but a keyboard or mouse can also be used. Matches are played out over three rounds of three and a game is only won when every player on the opposing team has been eliminated from the arena. This sounds simple but Roll7 have created a respawn system that encourages team play. When a player dies in the arena they can be revived by another player. Simply walk over their marker at the location of their death and the player will respawn. Keeping your team alive is just as important as capturing the laser nodes as they appear on the map. A successful team will be working hard to make sure their teammates stay in the fight for as long as possible. The arena in which you play is constantly changing, so fast sometimes that it requires some serious concentration. As laser nodes are constantly being captured spawning new beams it gets really frantic. It also starts hotting up as power-ups are dropped into the map which can turn a game on its head. These power-ups spawn in the arena and only need be walked over to activate. There are sixteen of these in total and they do everything from reversing the direction of the laser beams, speeding up their movement across the arena, or even switching the colours. Just keeping an eye on the action is hard enough but when you have to think about whether you should activate a power-up or not it adds extra pressure. Last but by no means least are the arenas themselves. Although they are all are rectangular, it’s what happens inside that changes. Arenas differ in the kinds of laser nodes they will spawn which in effect changes the layout inside the arenas themselves. Paying particular attention to which arena you are about to fight in is very important. That’s not all though, because players can warp from one side of the arena by walking through the edge and they will pop out the opposite side of the arean. This means you need to be constantly aware of what’s going on all over the arena because you don’t want to warp into an enemy’s laser beam as you make the jump. Laser League is an excellent example of a game that’s simple to pick up and play but is full of complexities that need to be mastered. This is a classic arcade multiplayer game that everyone should take for a spin because it’s a blast and it’s a bargain at £6.59. It’s fast, frantic, and incredibly challenging.